← Lynne Marshall’s Too Close For Comfort! In these days of high unemployment and global financial crisis, it’s nice to relax with a bottle of wine that doesn’t break your pocketbook. I’m here to sort out the memorable from the truly awful, and each bottle is under $10 unless noted otherwise. 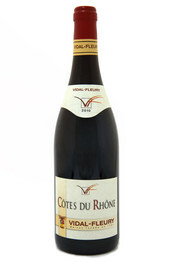 Vidal-Fleury Cotes du Rhone 2010 Imported by W.J. Deutsch and Sons Ltd, White Plains, NY Alcohol 14% by Volume; $12.99 at BevMo, on a 5 cent sale for two – $6.52 per bottle. My Take: An easy-drinking wine. Cotes du Rhone wines are plentiful in Europe, and are as close as a guarantee of an easy to drink wine as I can possibly give you. When the hubby and I were in the Netherlands many moons ago, we stopped at a gas station slash market, and bought two bottles of Cotes du Rhone (not the Vidal-Fleury, it must be said) for under $10. The cashier smirked at us, but I will say it was VERY drinkable wine! If you go for an undemanding red wine that you just want to sip and not worry about, then this is a good one. My Rating: ~ Very Drinkable ~ An easy-going wine that won’t offend you or your guests. 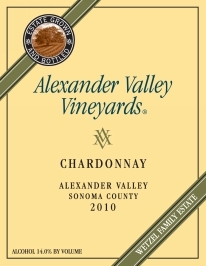 On the Label: “Everything about the Alexander Valley – the morning fog, the soils, the cool night air – create the perfect conditions for growing Chardonnay. When that fruit is in the hands of a skilled winemaker, you get a stellar wine like this 2010 Estate Chardonnay. Vibrant flavors of green apples, ripe pears and citrus unfold in the glass, making it a fine companion with sauteed shrimp or creamy pasta dishes. My Take: Well, as usual, I have to gag over the label. The first paragraph isn’t bad, but the second? Let’s just say they lost me at “Pour a glass…” . It’s like an author writing the back of the book blurb, and then writing “now open up the book and start reading to see how brilliant it is.” Um, not too classy. Okay, rant over. All that aside, the wine was a decent Chardonnay. It went well with roasted chicken and a spinach salad and some crunchy garlic bread (surprisingly well with the garlic bread, actually). For those of you who are turning your backs on buttery Chardonnays, don’t worry – the oak on this wine isn’t heavy and the butter doesn’t overwhelm. Overall, it’s a clean, crisp wine with just a hint of creaminess to it. That’s it for today, folks. It seems autumn has finally arrived in my neck of the woods, and soon we’ll be turning our clocks back. Remember to spread joy all throughout the year, and help your fellow humans in need whenever you can. Hugs! This entry was posted in Wine Friday and tagged Alexander Valley Vineyards, chardonnay, Cotes du Rhone, Vidal Fleury. Bookmark the permalink. I’ll be looking for the Vidal-Fleury Cotes du Rhone especially after the week that I’ve had. Oh hon! I’m so sorry. Are you going to EVA tomorrow? If so, wanna grab lunch? If you’re not going, I won’t go…I am SO freaking behind now. In everything. But I’d love to see you!